Painting Watercolor on 100% Acid Free Reg Paper | 14" x 14"
Painting Watercolor on 100% Acid Free Reg Paper | 18" x 36"
I have been inspired by the moods of nature. To me, Panchgani and Mahabaleshwar are places blessed with natural beauty – lush green woods, tall silver pine trees touching the sky, mountain ranges through which the Krishna River flows smoothly. The fields appear like squares and rectangles, dominating with emerald colors. Tiny orange and red spots sprinkled around the fields are huts which contrast beautifully. This is my paradise, and I am in awe of this treasure. It zaps my mind and body, and my soul reacts to create it on paper or canvas in my own way. It is an expression of my heart. Sometimes it is mysterious and scary, and at these times it is an outburst of expression. Painting engulfs my mind with sheer pleasure. 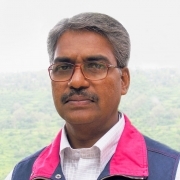 Sunil Kale was born in Kolhapur and currently resides in Panchgani. He has received a G.D. in art from Pune and also completed his B.A. from Shivaji University, Kolhapur. His paintings are mainly about nature and the peace of life that he enjoys in the valley where he stays. Kale’s painting was selected for the International Artist Magazine Contest in the USA. He has won awards for his landscape paintings from Mood Indigo (Mumbai), Abhinav Kala Mahavidyalaya (Pune) and by Rohan Builders (Pune). Sunil has held several solo exhibitions in various galleries across the country – a few being Balgangdharva Art Gallery (Pune), Jehangir Art Gallery (Mumbai) and Nehru Art Centre (Mumbai). His work has been displayed in various group exhibitions in India, and his work is showcased in private collections in India, France, Korea, USA, Zurich, Japan, Dubai, Netherlands, Canada and England.